Training Camp Question #8: Are Beane & McDermott Overconfident Or On Target? For the next 3 days, leading up to the start of Bills Training Camp, Buffalo Sports Page will ask and answer the ten biggest questions facing the team in 2018. 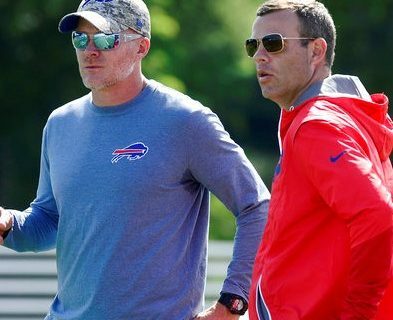 Sean McDermott and Brandon Beane – Still green, now over-confident, or right on target to where the franchise wants to go? Let’s face it. This duo did what no other Bills management partnership was able to do in 18 seasons. That being said, they have a combined 2 total years of experience at their current positions. I liked that they addressed the Nate Peterman “epic fail” decision to be starter at San Diego. You have to wonder how they would, or McDermott specifically, handle a similar decision if it comes to that at some point during the season. You have to imagine it will, even as soon as training camp. It might be even more tricky week and week out if the losses start to pile up, now that a third QB is in the mix. Also, this team enters training camp with the lingering speculation of what will happen with their most impactful player, Lesean McCoy. The NFL, and the Bills themselves, in no way can NOT take the charges seriously, regardless of the strength of the evidence. Some Bills fans don’t want to hear that, but this is 2018. Tabloids sell unfortunately. Expect it to be a topic of discussion inside and outside the locker room, at least for a little while. It may be up to GM and coach to handle it at whatever degree they want to. The naysayers claim this upcoming season on paper is arguably a few wins worse than last season. ‘Experts’ have been burying the Bills with their prognostics. That makes for a long familiar Bills season. The ‘trust the process’ people feel like finally Bills management has something going on here. By cutting loose some of the previous regime’s draft picks and acquisitions while adding some of their own, they were able to (with some help from now WNY superhero Andy Dalton) finally land that painfully elusive playoff berth last New Year’s Eve. Every NFL season there are teams whose success or failure is a league-wide head scratcher. Coaches and GM’s so-to-speak “shock the world” —- both good and bad. Vikings 13-3? Packers 7-9? Raiders 6-10? Giants 3-13? Eagles win SUPER BOWL?!?!? We’ll find out more throughout the rest of 2018, but maybe lower management remains a serious question heading into training camp.